YotaPhone 2, What's been Improved over the Year? YotaPhone 2, What’s been Improved over the Year? Yotaphone was a smartphone from a Russian company which was released a year back and the supply was kept limited to some markets. The smartphone had two displays, a normal display at the front while an e-ink display on the back. E-ink display being used on a smartphone was something seen for the first time, but because of limited market supply and the limitations to the functionality on the e-ink display made the smartphone remain unnoticed. 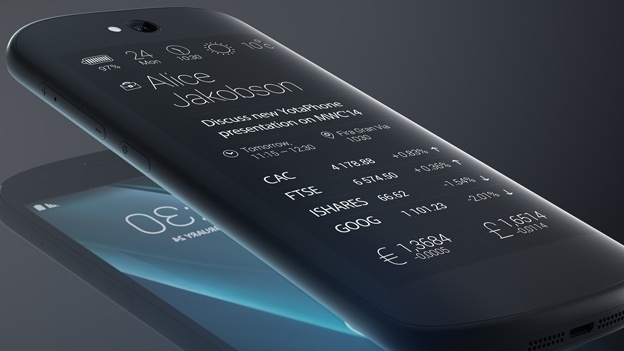 The Russian company made a better an improved version of their smartphone called Yotaphone 2 and a prototype version was introduced at Mobile World Congress. From the looks of it the smartphone resembles the Samsung Nexus S smartphone a lot because of the curved design and the simple look of the smartphone. The Yotaphone 2 comes with a 5-inch display supporting a resolution of 1920 x 1080 while a 4.7-inch e-ink display on the back supporting a resolution of 540 x 960, Qualcomm Snapdragon 800 processor, 2GB of RAM, 32GB of built in storage space, 8MP rear shooter with flash while a 2MP camera at the front. The prototype model of Yotaphone is equipped with all the latest hardware that the market has to offer and with the help of its e-ink display at the back, users will get an amazing battery time as the e-ink display barely uses any power. The company have improved the e-ink display from the previous one giving it more functionality. The e-ink display will show you your notifications, weather, wallpapers and music. The company will further expand the functionality of the e-ink display by creating more custom apps for it. The e-ink screen will always stay on so you can set a wallpaper on it which will make the phone look rather appealing from the back side. Yotaphone 2 will have LTE support and will come with Android kitkat 4.4 working out of the box. The smartphone will be launched at the end of this year and as for the other markets like US and China the smartphone will get launched in 2015.